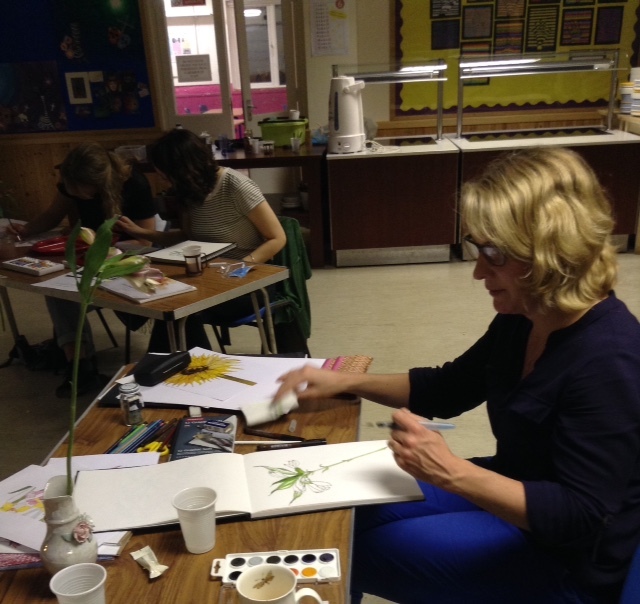 Sonia gave us a wonderful demonstration of her skills using ink wash, charcoal and pastels. She also provided an interesting background history of the church in Poland which she was using a photograph of for her demonstration. Members enjoyed a good celebration evening at Benslow Music Trust. 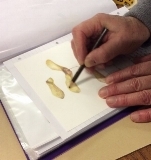 Pauline gave a wonderful demonstration in the use of watercolour for a portrait. She also showed us some of her illustration work for children’s books. 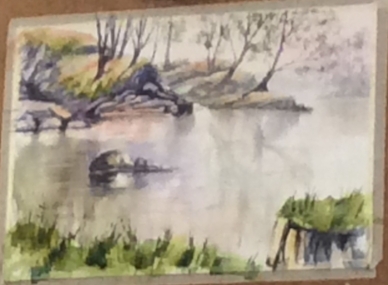 Peter Barker showed his Oil painting techniques including using a decorating paint brush to produce an amazing river view in under 2 hrs ! Mike Rollins gave us an interesting and entertaining workshop learning his methods of painting a landscape with mountains, lake and rolling clouds. Model Liane in Tudor dress once again proved popular. 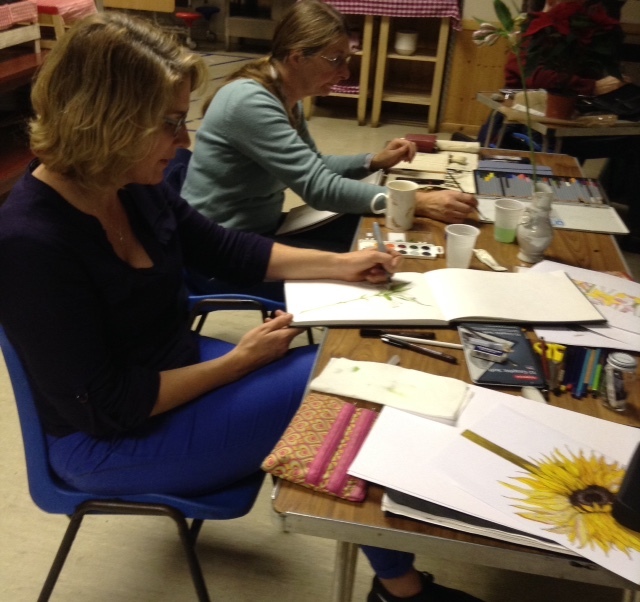 Members enjoyed an afternoon painting in the Walled Garden.Many thanks to member Annette for organising it. Mike Rollins gave us an entertaining and interesting demonstration of his way of using acrylics for a painting of Haworth village high street. Lianne poses in her Tudor dress. James lead an enthusiastic and helpful workshop on the use of Ultramarine and Burnt Sienna for the use of cast and reflective shadows. we also learned about measuring faces when drawing portraits. Members who attended the talk about framing and mounting at Kendall's Framing in Letchworth were rewarded with an interesting demonstration of the computer mount cutting equipment and the variety of frames available. Emmeline Webb lead an interesting and productive evening, printing with a soft block on to tea towels , bags and cushion covers. We were all pleased with the results ! James Mayhew gave us an interesting evening with a talk about his career as a children's illustrator showing us how he developed the Katie series of books. He followed with an amazing story telling with painting to the music of The Firebird by Stravinsky. John Tookey discussed his methods of using watercolour and pastels to produce a colourful picture whilst he was talking.